Car rental companies can be either a nightmare or a blessing – depending on which of them you choose. As it now seems like there’s a car rental company appearing every night in the big cities, we saw it fit that we cover this wild west of the rental industry. We’re here with a guide: the dos and don’ts, the pros and cons, things to look out for, and things that you may want to say yes to. This complete guide to car rental companies will guide you through the inner workings of this part of the rental industry. Car rentals are many and complex. If we are to think only of the car rental service of Hertz (one of the most famous companies) – they have so many options, it’s often hard to choose from all of them. And that’s just one company! Imagine how many companies there are in the whole of the US. This is getting to be an increasingly complicated problem. Don’t worry – we’re here to bring order to your car renting conundrum. For you to better understand this issue, we’ve divided the article into subsections. In the first one, we’re going to ask ourselves: why rent? What are the general advantages or renting a car over buying one? Next up, we’re going to figure out how one can rent a car. The exact process for this differs greatly from company to company, so we’ll just skim the surface of this one. Moving on to more concrete things, we’re going to talk about the pros and cons of rental car companies. Here we’ll focus on exact issues that may arise with rental companies and ways to avoid these. Lastly, we’re going to conclude with a section about the types of car rentals that exist, because, as you may know, not all car rental companies are the same. Some offer convertible car rental, others are for mini van rental, or Mini Cooper rental, even limousine rentals, or sports car rentals (for those of you that live for speed). Although it isn’t nice to imply money is an issue, it most definitely is for all the people out there to rent a car. Buying a car is not only incredibly expensive in the short term, it will also make itself felt in your wallet on the long term: just think of all the repairs you’ll have to make in order to maintain the vehicle in mint condition. Short term jobs. So you’re going to have a job out of town and you’re thinking whether you should bring your car with you, or just take the plane and rent another car once you reach your destination. I’m going to let you decide what the best option is. New drivers. If your kid just got his driver’s license and wants to practice but you don’t trust him or her that much yet, there are plenty of car companies that offer to rent cars to the young motoring enthusiast, with the only disadvantage being that those cars are usually not that good. Still good for practice. Drive dream cars. Renting sports cars is definitely cheaper than buying them. And this is a sure way to actually test out your dream car. Maybe you’ve seen it on Top Gear and now you’re dreaming of the new Ford Mustang. Buying one is out of the question – what’s left for you to do? Stuck on the other side of town. You left your car at home, you took a cab over to your friend’s house. Nobody wants to drive you home and you don’t want to take public transit – what do you do? You rent a car of course. The cheapest car rental company in the neighborhood should do. Go to the car rental company’s website. Most car rental services have a website. If your desired rental car service doesn’t have one, then the only option is to walk into their dealership and pick one on the spot. Select the type of car you want. Again – most companies have different car types from which you can choose. You can either get a sports car, an economy car, a family van, mini van rental, an SUV, or just about any other type of car you may think of. Set a pick-up location. Select where you want to get your car from. Most companies have lists of locations available for all users. All you have to do is choose one of these locations and your car will be delivered there. Set a pick-up date. It just so happens that you may not want your car right away. Maybe you’re planning a really important business trip next week and want to make sure everything is perfect ahead of time. Set a return location. Most car rental companies allow you to bring the car back at a different location from the one you rented it from. It seems they figured out that people use cars to go from one place to another (usually). You can choose any other location that the company has for this. Set a return date. After all the steps above are done, you just have to choose your return date and you’re done. Some rental services let you have the cars for even up to a month. However, renting a car for that long can put a serious hole in your budget. Add any promo codes and request rates. If you have promo codes (from past rentals or from company surveys) you can add them at the end of your rental request. After this has been done, all you have to do is ask the rates you can get. Most likely, you will get your estimates on the spot. PRO: Along with your car, the biggest car rental companies also give you a GPS. That’s so you don’t get lost while driving their car and (maybe) forget to return it. In all seriousness, though, a GPS really comes in handy – especially when you’re in a city where you don’t know the roads well enough. CON: Any damage to that GPS may cost you a small fortune. GPS devices aren’t that expensive, but if you want to spare yourself the trouble of paying up a few extra hundred dollars then you may want to be extra careful. Make sure that the GPS is safely secured and that it doesn’t fall off at tight turns. PRO: Rented cars (usually) have a full tank of fuel. Provided you’re not going to make a marathon run across the US, then you should be safe. This means that you won’t have to pay extra when returning the car. CON: What you will have to pay for, sometimes, is a refill. Depending on how much you used the car, you may end up paying way too much on fuel. Still, it’s convenient for when you really don’t want to stop for fuel too often. PRO: Car rental companies take care of their cars. It’s a given fact: some of you simply are too busy to take adequate care of your car. The best car rental company will always give their car to the user in mint condition. It’s more of a question of honorable business than of actual rental rules. Renting a minivan has never been easier! CON: You may become paranoid in traffic. Several studies have shown that people who rent cars that aren’t from the cheapest car rental company become a bit scared. Their attitude in traffic changes because they fear a collision will make them pay repair fees much bigger than they can afford. PRO: You can look fancy driving a car that you might not be able to afford. Your significant other will think that you got a raise, or that you’ve rented the car, especially so that you can have a sophisticated night out, dreaming of the bright future you two will have together. You and the car, that is. CON: If you decide to rent a big sports car for a longer period of time, you may end up paying more than for actually buying a cheap second-hand car that works. Believe it or not, there are some really good deals on the second-hand market these days. PRO: You can get off your plane and get into your rented car. Most car rental companies have dealerships right off the airport runway. If we’ve ever lived in the era of convenience, this has to be it, doesn’t it? CON: The companies that give you the car at the airport usually expect it back at the airport. So it’s not really that convenient – you still have to drive it back to the dealership. Still, most businessmen and women traveling all over the US see this as a major advantage. Do you now know all there is to know about car rental companies? Good. Now we can move on to the most important part of this guide: the types of rental companies, all fitted with examples depending on the case. We would nominate minivans for the most practical vehicles in history. 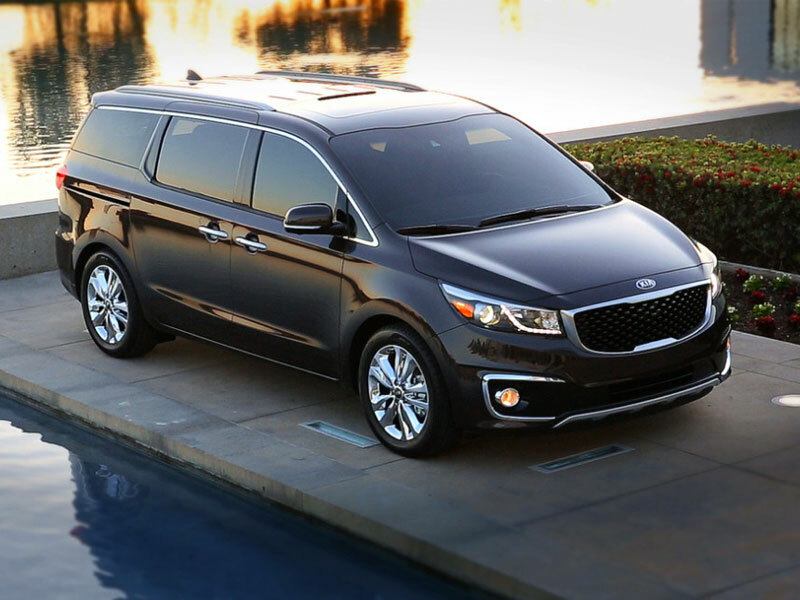 Minivans have great room for you, your family, and the extra luggage you need for that cross-country trip. There’s just no other way around it: minivans are the go-to choice for families across the US. And if you want to rent one – you’re in luck. Most car rental companies give out minivans for very affordable rates. You can find a more detailed story in our article on the subject. BONUS: Like Mini Coopers? We do too! So much so that we’ve made a small guide where Mini enthusiasts can find all about their Mini Cooper rental. For when you want to go to a party in style. The best car rental companies have to have limousines for rent. It’s become an unspoken rule of the game. Classy and sleek, there isn’t a better way to make an entrance than by having someone open your limo door. But limousine rentals are a bit different from traditional car rental companies. And that’s why we’ve also dedicated a whole page specifically to this category. Like with convertibles, not all car rental dealerships like to offer sports cars. Most of these businesses settle for “normal” cars that don’t offer much excitement. But if you like fast driving, then sports car rentals may be the thing for you. And that’s especially true if you wouldn’t normally afford to buy sports cars. If you want more info about sports car rentals, check out our guide. It seems that the contest for the best car rental company is far from over. Today, more and more of these companies are seeking to expand their fleet on an international level. We hope that, for the time being, you have managed to gain some new insight on account of our car rental companies guide. If you’ve enjoyed this article, or if you have any suggestions, don’t hesitate to call on us via the comments section or our contact form.